For most, the day of their wedding is the most important day of their life. It is a day that you show your love for your partner and your commitment in front of all your friends and family. The gifts for such a special event have to be carefully chosen and if you are attending to one this summer, here are a few ideas on what to get the great couple. Try to get something that will show that you understand their love and that you support them in anything they want to do. There are a lot of matching objects, for him and for her, to choose from; everything ranging from cups and champagne glasses to pillows and pajamas. More elegant gifts can include a nice bottle of wine or even a small wine cooler to always keep their favorite bottles at exactly the right temperature. Other things to have a around that house that will remember them of this special day can be paintings, you can take a picture of them or of the place they first met and turn it into a great looking painting for them to hang in their room. Exotic candles or a cool candle holder for future romantic dinners at home are always good ideas. Since we are on the topic of romantic dinners, you can offer to pay for a night out on one of their favorite restaurants; they will surely appreciate this gift and they will also have a lot of fun. Some of the most common wedding gifts are things for around the house, like plates and tea sets. If you plan on getting something similar, try to do it in a unique way and get something trendy and with style. A cool looking sake set will definitely look good and although they might not use it that often, it is a great addition to the style of their kitchen. If you want to get them something funny, why not a manual on how to survive after the wedding? It has some hilarious stories about events that happened to newlyweds and how their love got them through it. 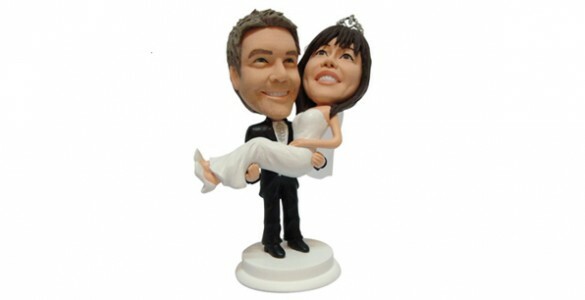 Other funny gifts may include specially made caricatures of them, paintings or even personalized him and her dolls for the top of the wedding cake. No matter what you choose to get, remember to make them feel special and have fun at the wedding.